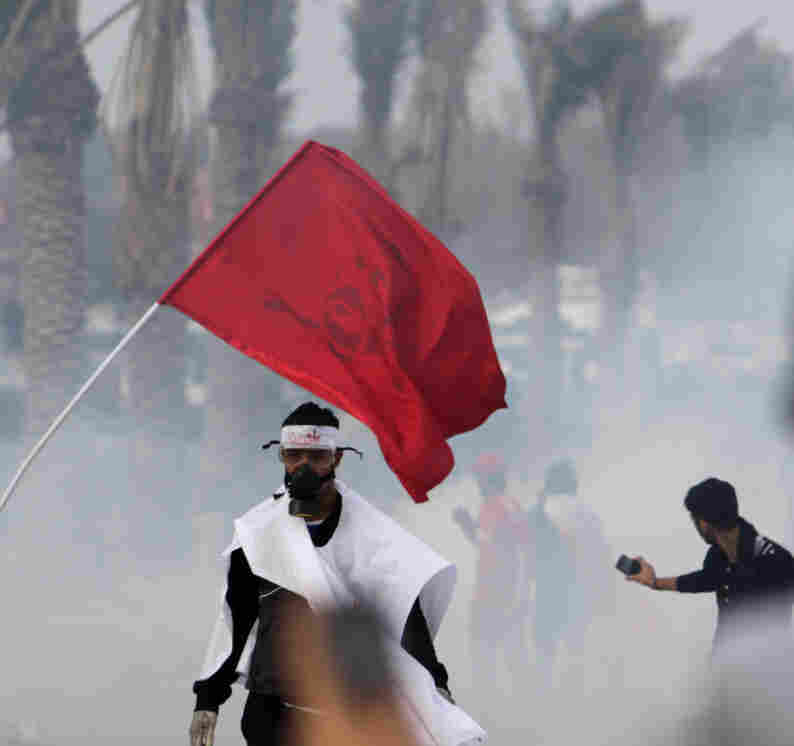 A Year After Uprising, Bahrain Sees Protests Quelled By Tear Gas : The Two-Way A year after an uprising began in the Gulf nation much remains the same. Government security forces used tear gas and stun grenades to stop protests before they began. Bahraini anti-government protesters react to tear gas fired by riot police on Monday. Today marks a year since an uprising started in the Gulf Nation of Bahrain. And over the course of the year, we saw lots of protests, and we saw the Gulf Cooperation Council send troops into the country to quash the rebellion. We saw the monarchy dismantle the Pearl Roundabout, which had become symbolic of the uprising and later commission a report about what went wrong at the height of the protests last February. Today, we saw that things haven't moved very much since the uprising began. People took the streets and government security forces used tear gas to try to disperse the demonstrations. "Protesters marched from Sanabis, Deih and Jidhafs, which lie few miles west of Manama, despite police warning that protests would be dispersed, witnesses said. "'Down with (King) Hamad!' they chanted. "The Coalition of the Youth of February 14th Revolution, a hardline group that operates separate from the political opposition led by Al-Wefaq, declared on Tuesday the day to return to the square that was razed after the mid-March crackdown. "'All of us are returning' to the square, read a call for protest posted on its Facebook page, designating 6:40am (0340 GMT) as the starting time." The AP reports that crown blamed the country's Shiite opposition for the violence that erupted late Monday. The AP adds that government forces "fired tear gas and stun grenades... to prevent the opposition from staging a mass rally." "One could even argue that the U.S. alliance with Bahrain could be compared to Russia's alliance with Syria. Both global powers have major naval bases in the respective countries that they do not want to relocate and fear to lose in case of a regime change. Of course the Syrian regime's response has been more vicious and deadly than in Bahrain, but Bahrain's tiny population means that the death toll per capita is one of the highest in the Arab uprisings. The West would indeed be well advised to live up to its ideals of democracy, citizenship, and human rights and develop a consistent response to the demands of people in the Middle East, rather than again becoming entangled in the old game of short-term alliances and geopolitics. The hopes that this could happen, however, were crushed in the crackdown on the Pearl Roundabout almost a year ago. It will not be easy to rekindle them."